Kelly Winter specializes in medical malpractice, professional liability, mass torts, products liability, and premises liability. She enjoys representing injured individuals against corporate giants and especially enjoys representing women in cases involving women's health issues. 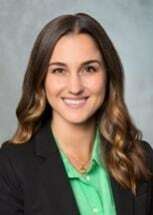 During law school, Kelly was a clinical extern for the Project for the Innocent at Loyola Law School - a student clinic which has successfully aided in exonerating wrongfully convicted individuals. Kelly clerked at Girardi | Keese full-time through law school and has continued her work here as an associate attorney.